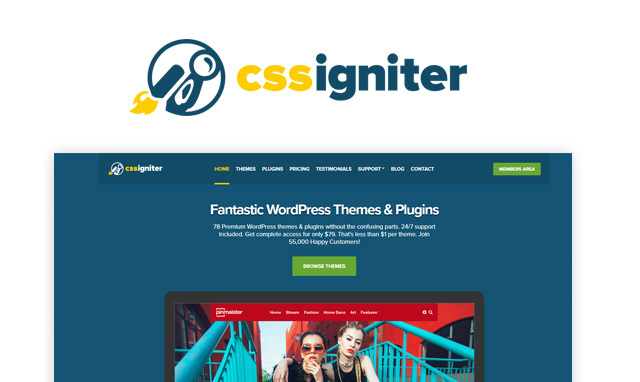 CSSIgniter are one of the best premium WordPress theme companies around, they have created over 78 great looking themes which have been sold to over 55,000 happy customers. They have a range of themes for most purposes such as blogging, business, music, hotel, woocommerce and so on – everything you’d expect from a top theme company. You can purchase individual themes for $49 each but their $79 bundle makes most sense as it includes all their themes, plugins, customer support and updates for one year. They even include photoshop files and HTML templates with each theme which makes perfect sense for developers who can use these themes for their clients. We are old friends with CSSIgniter and have teamed up with them to bring you this exclusive coupon code which gives you 30% off any purchases at the site. Use our exclusive coupon code to get a 30 % discount off any single WordPress themes or bundles.